Coming Soon - Bright Lights 2018! Get Ready MANVILLE! Bright Lights 2018 will be here before you know it! Register your home beginning on November 1st through December 5th by 10pm. Our official Voting Guitar Picks will also be available next week. Check back next week! MAC New Programming Year meeting this Monday! 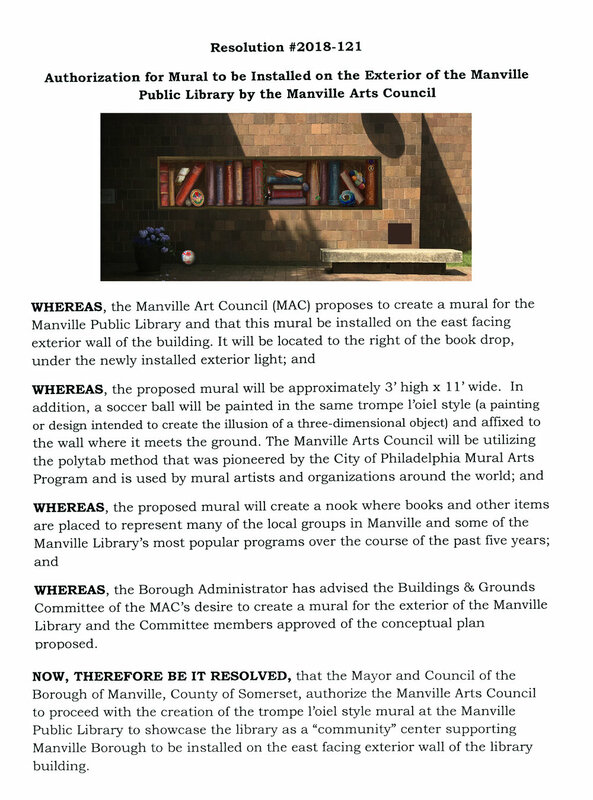 The Manville Art Council proudly announces our first mural installation will be at the Manville Public Library. 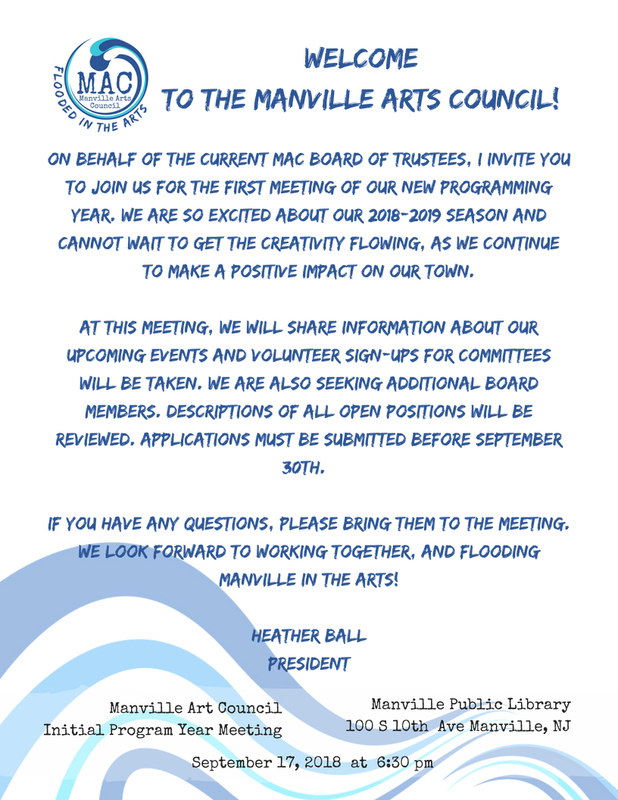 The Manville Borough Council has approved the design by our President Heather Ball. The Manville Branch of the Somerset County Library System is more than just a place to check out books. This building acts as a community center for our town. Many community groups and organizations use the library as a place to hold their meeting and host events. The concept of the proposed library mural endeavors to showcase how the library supports our community. This trompe l’oeil mural creates a nook where books and different items have been placed to represent many of the local groups as well as some of the library’s most popular programs over the past five years. Each time viewers look at the artwork they will see a new item they never noticed before inspiring them to discover what the item represents. We hope this mural will motivate the residents of Manville to find their own way to make positive impact within the community. We can't wait to install the final result as the community comes together to create this mural. Stay tuned for upcoming announcements on how you can be involved. The Deadline to submit an application to our 3rd Annual Arts Expo is next Sunday, April 15th. Don't delay. Space is filling up quickly! We'd LOVE to see your art in our show! CLICK HERE for the guidlines and application. Apply NOW!!! Be sure not to miss out on voting for your favorite decorated Bright Lights house. You could win a prize too just for voting. Get voting guitar picks at the Manville Public Library during regular hours 9am to 9pm. Voting will end on Thursday, December 21 at 9:30pm. We will announce the winners on Saturday, December 23 via Facebook Live. Tune In!